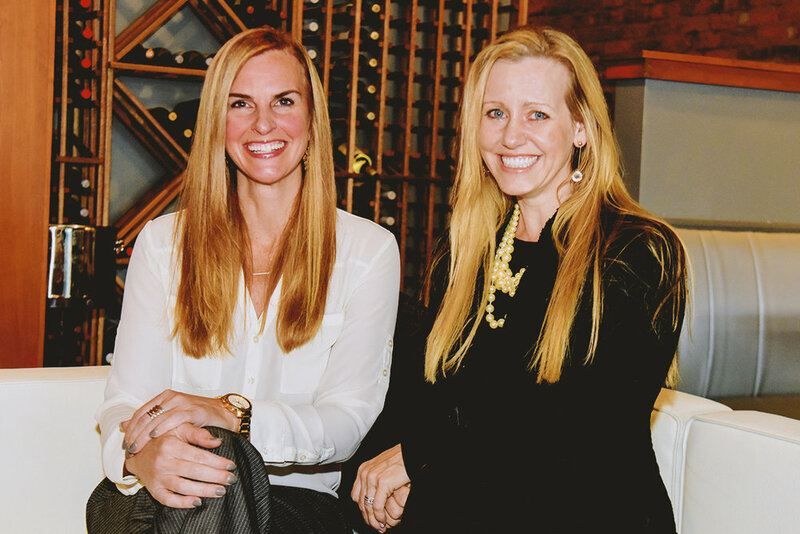 Heather Frechette (l) and Elizabeth Hunt (r), co-owners of On the Roxx and Encore Gastrolounge in Greenville, South Carolina. All photos by Kevin Ruck. Every great bar begins with a great concept, and that’s exactly what Heather Frechette and Elizabeth Hunt started out with nearly a decade ago. 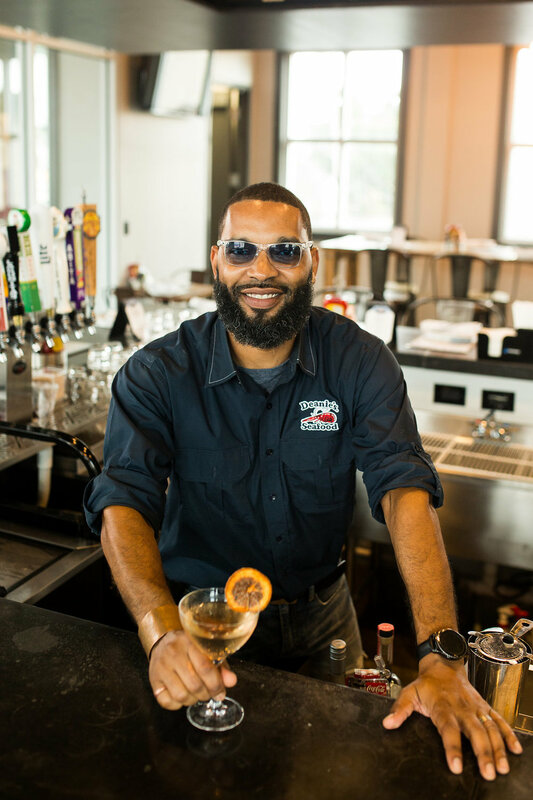 By steadily saving up bartending tips and working various day jobs, the duo opened On the Roxx in Greenville’s historic West End in 2009. With their first success under their belts, the duo opened Encore Gastrolounge earlier this year. We recently chatted with Heather about what it takes to be a successful bar and restaurant owner, her Golden Rule of hospitality, and her favorite Belle Isle cocktail. Heather Frechette, co-owner of On the Roxx, Encore Gastrolounge, and the Encore Event Venue. How long have you owned a restaurant? What did you do before you owned a restaurant? We have owned On the Roxx for nine years! I did everything from teaching school to technology sales but always bartended as a second job and saved up tip money to open our own place. When I moved to South Carolina from upstate New York, I didn’t know a lot of people. I started out as a cocktail waitress to fill some time and meet new people. I would stay late and come in on nights off to learn to bartend. Any pro-tips for someone starting up a restaurant? Do your homework! It takes a lot of hours and dedication, not to mention the amount of paperwork, licenses, and permits needed just to get open. There is so much more to running a successful restaurant than just managing during operating hours. I love a good spicy margarita. The Tucker G&T which is on the menu at Encore. I actually came up with the recipe in a dream. It consists of gin, Jack Rudy Small Batch Tonic, club soda, and a scoop of house made lime sorbet. What’s your favorite part about owning restaurants and bars? The many amazing people that I get to meet. I love hearing about their vacations, families, and everything else. Several people who have met at Roxx are now married and having children. It’s really fun to celebrate these special milestones with our customers, who are now friends! I enjoy going anywhere with outdoor seating when weather permits. A great view is always fun, too. When traveling, the first thing I look for is the best rooftop bar. What’s your take on today’s cocktail culture? I love the popularity of craft cocktails and creativity in mixology, but I also appreciate a good hole in the wall. Give us your golden rule when it comes to the restaurant business? Golden Rule for anyone in the hospitality industry: Give the best experience to every customer. A bad review or shared bad experience can go viral and destroy a restaurant’s reputation. I love the Belle Isle Honey Habanero in the Mellow Habanero. Make your bird a little boozier this Thanksgiving. 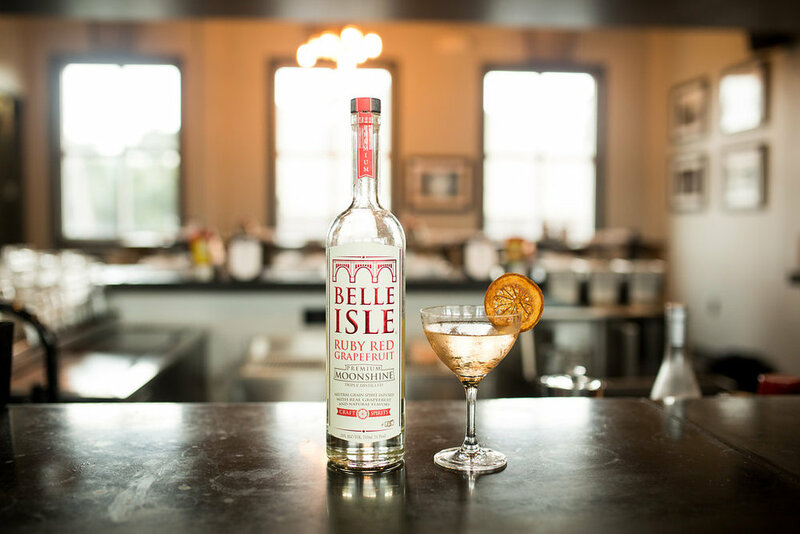 Here at Belle Isle Moonshine, we know how to mix a mean cocktail that’s perfect for any occasion. A little outside of our comfort zone, though? Preparing a full Thanksgiving dinner. 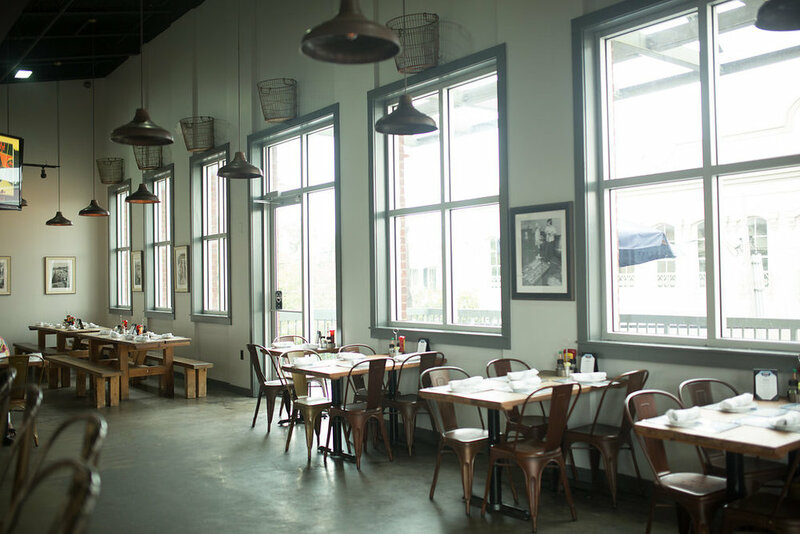 That’s why we enlisted the help of our friend Scott Lewis, head chef at Laura Lee’s in Richmond, to help us out with a few recipes sure to satisfy your whole crazy family this Thanksgiving. Just like last year’s Cranberry Saucey Sauce courtesy of Chef Mike Ledesma, Scott’s menu packs a boozy punch. Because who hasn’t been eating Thanksgiving dinner and thought, “This gravy is good, but it would be better with some moonshine?” Grab yourself a bottle Belle Isle Cold Brew Coffee and let’s get cooking! *Serving Size: Recipe for one hen. Serve one for each guest. Mix salt, pepper, and rosemary in a small bowl and season hen with mixture. Put hen in a screaming hot pan skin-side down, then (carefully!) pour in Belle Isle Cold Brew Coffee to deglaze. Place entire pan in oven for 6-8 minutes. Let rest for 10 minutes before eating. Top with freshly chopped parsley. Preheat oven to 300° F. Chop biscuits into ¼ in. cubes, then place on a large sheet tray. Pour 1 cup of melted butter over biscuits. Mix 1 tbsp. of pepper and 1 tbsp. salt in a small bowl, then spread evenly on sheet tray. Dehydrate in the oven until the biscuits are hard like croutons. Sauté onion, celery, and carrots in 1 cup of butter until onions are translucent, then add mixture to biscuits. Add chopped herbs, then put the whole mixture in a baking tray. Pour chicken stock on top. Heat fat or butter in a saucepan over medium heat until starting to brown a little. Add flour until brown, then add Belle Isle and regular coffee. Stir until thick, about 8 minutes. Add a splash of cream, salt and pepper to taste, and sausage if you’d like. If the mixture is too thin, cook down a little longer or add a little extra flour. Preheat oven to 325° F. Heat cream and corn over medium heat in a sauce pot until corn is thawed. Blend corn and cream until smooth. Add salt, pepper, and sugar as you blend. As slowly as possible, whisk hot corn mixture into egg yolks. Pour mixture into a 6” x 6” baking tray, then put tray into a water bath, then bake in the oven for 45 min. to 1 hour until firm. Top with crumbled Cotija cheese and jalapeños. Happy Thanksgiving from Scott, his adorable daughter Yoomi, and everyone on the Belle Isle team! Need some cocktails to pair with this meal? All photos by Maggie DeWitt. 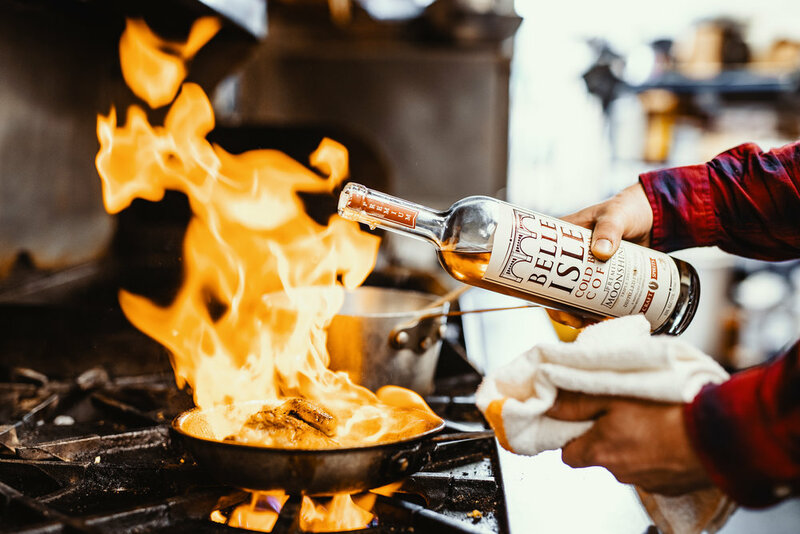 We here at Belle Isle Moonshine have a lot of amazing friends and restaurant partners all over the country, and we want everyone to love them as much as we do. In our new journal series, ‘Shine Spotlight, we’re showcasing the people (and cocktails!) that make these places so great! First up: Deanie’s Sea Food Kitchen in New Orleans! With more than 50 years as a New Orleans institution, Deanie’s is no spring chicken. For the past five decades, Deanie’s has been serving up some of the best seafood in a town known for world-class seafood. Owner and General Manager Chandra Chifici-Scarber, whose family has owned Deanie’s for 36 years, says the restaurants aim to be a welcoming place where everyone feels like family. 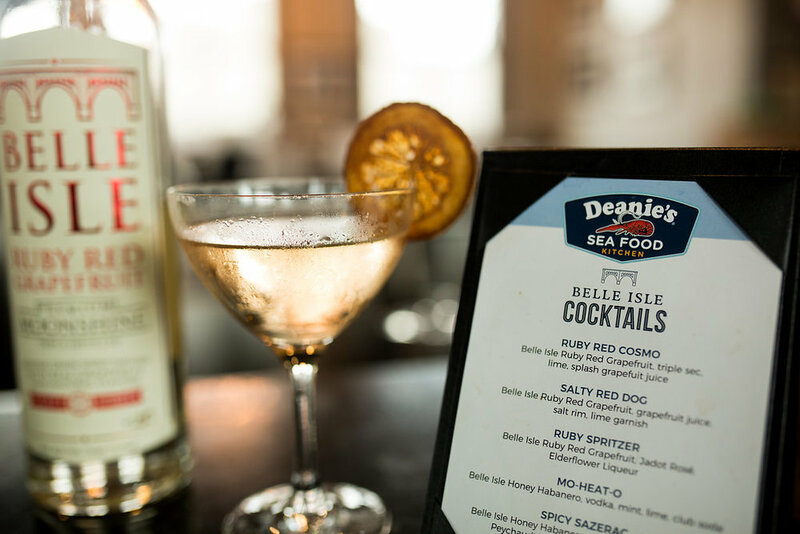 Deanie’s opened its newest location on bustling Magazine Street back in June, bringing the Garden District some serious Cajun cuisine – and equally impressive Belle Isle cocktails! 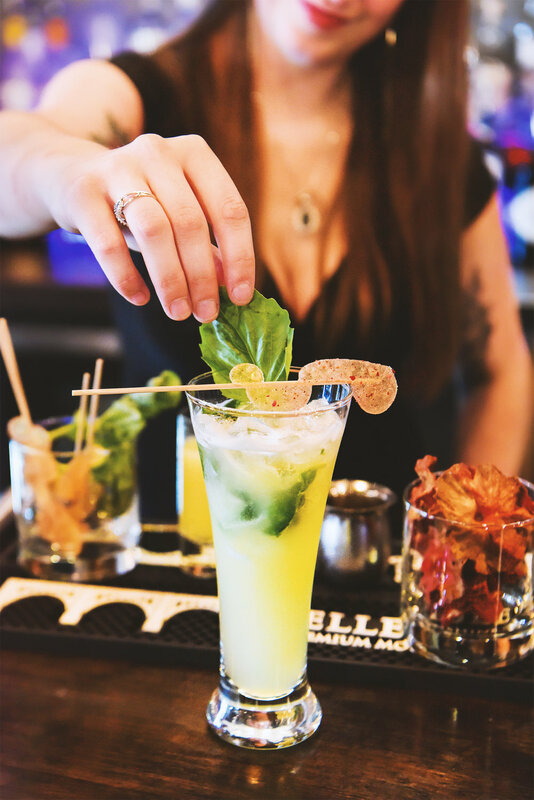 If you’re in The Big Easy, head to the new Deanie’s and let bartender Eric whip you up something from their Belle Isle featured cocktail menu! Check out the recipe for the Deanie’s Ruby Spritzer below! Add all ingredients to a mixing tin over ice. Shake and strain into a martini or wine glass.